2015 Onyx Authenticated Platinum Elite Baseball isn't complicated. It's an easy and moderately affordable way to get cards and autographs from some of baseball's key prospects. While boxes come with only four cards, the price is kept in check compared to a lot of other autograph-heavy products. 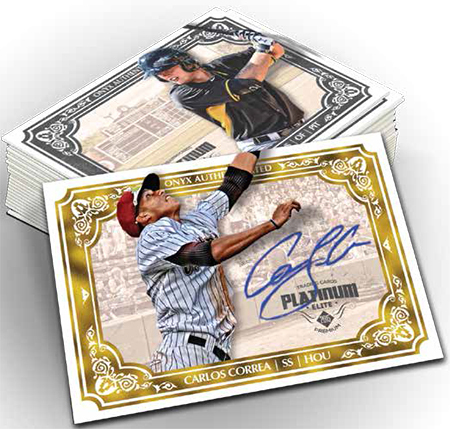 Each 2015 Onyx Authenticated Platinum Elite Baseball box has at least one autograph. Every other box has a pair of autographs. There are six levels of signed parallels: Blue (#/200), Green (#/50), Orange (#/25), Red (#/10), Gold (#/5) and Inscribed Purple (1/1). Miguel Sano, Carlos Correa, Tyler Kolek and Byron Buxton are among the product's signers. The checklist is relatively small, which means a better shot at top players. Randomly inserted are Wood Hot Boxes. These have eight cards, four of which are autographs. One of the hot box signed cards is numbered to 5 or less. Some of the boxes themselves are signed as well. The following is a preliminary list of players appearing in the product and is subject to change. Great value of a product, pulled quite a few Devers, Buxton’s, Sano, Severino, and two Correa’s. Great looking color and autos. 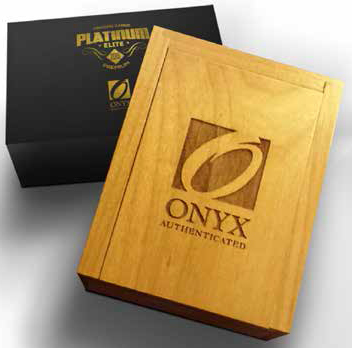 Hopefully Onyx continues to grow and this product can continue to garner some good names. Purchased this on a whim after not enjoying some of their previous card releases and thought I’d give them another chance. No hot box/wood box in my case. no buxton’s, no nick gordons, no Breyvic Valera (auto’s or base cards for any of them). One Gallo auto and no base. A ton of Teoscar, Kaminsky, Meadows, Sano, & Severino. Price point is good for what you get. Would have been nice to see the Blues numbered. The rest were hand numbered including a Meadows /5 which looks like the base card. Also no purples from what I could see. They are getting better from previous years though. Nick Gordon actually didn’t make it into the product after signing a deal with Topps. Unfortunate that you didn’t pull any Buxton, I got a few but missed on some Severino and Greg Bird. I pulled nearly a complete set (if the above checklist is complete) of autos, including ALL the “big” names, but was disappointed with the over-duplication and the poor collation. Four boxes from the case contained only 1 auto’d card. Love the design of the base set, but the auto’d cards could have used an upgrade over the same design as last year’s release. GREAT VALUE FOR THE MONEY! Anyone have an estimate on the odds of getting a wood box in a case? See a few deals out there, and thinking of taking a chance on a case. And my 4 stars is for poor collation as well. No big names, several dupes, and not one 2 autographed box in the 13 I bought either. Not good.